calamity | KBK Bakery's Adventures in Baking! Well, at least that is what it was supposed to be. I have to say, that I count this among one of my true failures in the baking world. Don’t get me wrong, it tasted good, but it was not what it was supposed to be. You see it all started many years ago when they opened a Bahama Breeze restaurant in Louisville… Loving restaurants the way we do, my friends and I immediately went to try the new place. And there we discovered something wonderful. Something sinful. Something truly truly scrumptious. Jose’s Tres Leches. It is a Tres Leches in that it has the 3 milk soaking, but it is chocolate. An absolutely wonderful addition. And the icing? Regular meringue? Ooooh no. Chocolate mousse. This soon became my friend Becky’s favorite dessert. We would go there for dinner just for the dessert. Heck, there were times we’d go somewhere else for dinner and go to Bahama Breeze just for dessert. But alas, our Bahama Breeze left us last year. We have no idea why. The place was always packed. As a result, Becky lost her beloved dessert. Being the true friend and fellow Jose’s fan, I promised Becky a replacement. I found several recipes online. Becky is all set to be my guinea pig on all the variations. This was the first. I don’t know where I found this recipe online, forgot to note it. (if it’s your recipe, please let me know and I’ll credit you.) I changed it only slightly by reducing the flour by 1/3 cup and replacing it with 1/3 cup of cocoa powder. The cake came together beautifully. It was airy and full. Just like it should be (basically a sponge). I baked it for 35 minutes. My toothpick came out clean. It was all puffed up and filled the pan. I set it on a cooling rack and five minutes later. When I came back. *sunk* It was shriveled up and sunken in like a big brown raisin. It was so depressing. I know with a regular sponge, like angel food cake, you hang the pan to cool so the cake doesn’t fall, but how do I do that with a 9 x 13 pan?!? Sigh. It was sooo not pretty. Then I tried my hand at the chocolate mousse. Sigh. Again. Everything kind of… seized… when I added the chocolate. After adding the whipped cream it loosened up a bit, but it lost most of its *fluff*. The color was much darker than it should have been. This version serves 10 generous portions. METHOD: Preheat oven to 350°F. Generously butter a 13 x 9-inch baking dish. CAKE: Beat 3/4 cup sugar and the egg yolks until light and fluffy, about 5 minutes. Fold in the milk, vanilla, flour and baking powder. Beat the egg whites to soft peaks, adding the cream of tartar after 20 seconds. Gradually add the remaining 1/4 cup sugar and continue beating until the whites are glossy and firm, but not dry. Gently fold the whites into the yolk mixture. Pour this batter into the buttered baking dish. Bake the cake until it feels firm and an inserted toothpick comes out clean, about 30-45 minutes. Let the cake cool completely in baking dish. Pierce the cake all over with a fork, taking care to not tear it up. MILK SYRUP: Combine the evaporated milk, sweetened condensed milk, cream, vanilla and rum in a mixing bowl. Whisk until well blended. 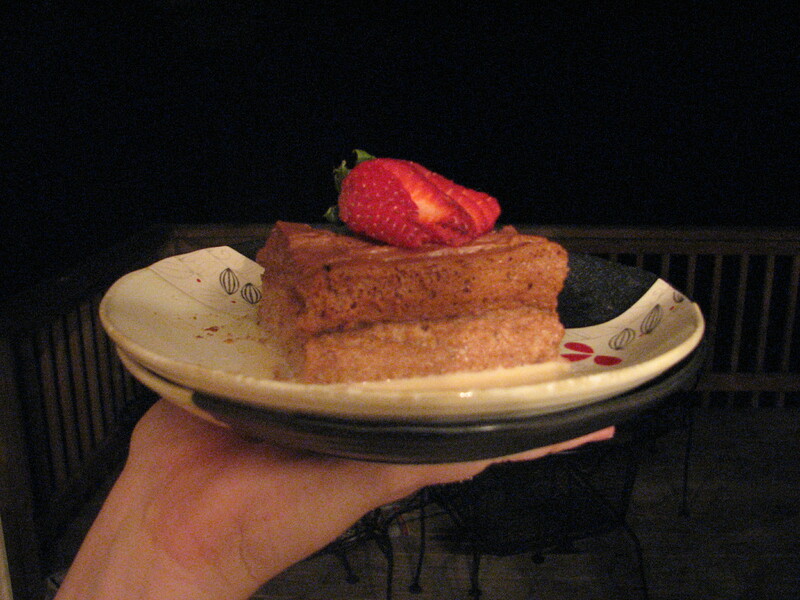 Pour the syrup over the cake, spooning the overflow back on top, until it is all absorbed. When ready to serve, cut a slice and plate it. Top with a dollop of freshly whipped cream or a side of ice cream, dust cake and cream with some fresh cocoa powder and place a slice or two of fresh mango on the side. This cake is addictive- you’ve been warned! Enjoy! Chocolate Mousse: In a medium-sized stainless steel bowl set over a saucepan of simmering water, melt the chocolate. Set aside but keep the bowl over the warm water so the chocolate will stay slightly warm. In the bowl of an electric mixer (or with a hand mixer), whip the heavy cream until soft peaks form. Refrigerate, covered, until needed. Place the egg yolks in a large heatproof bowl and set aside. Remove the bowl from the heat and, working quickly, scrape the egg mixture into a clean large bowl of your electric mixer. On medium speed (or with a hand mixer) beat until the volume has doubled and the bottom of the bowl is completely cool to the touch. Turn speed to low, and beat in the warm melted chocolate until well combined. Fold in half the reserved whipped cream and then fold in the remaining cream. The mixture should resemble softly whipped cream. This can be used immediately or refrigerated, covered, until needed. If the mixture seems a little runny, the chocolate may have been too warm, but after refrigerating for an hour or so, it will firm up. Can be made and refrigerate a day ahead of time. 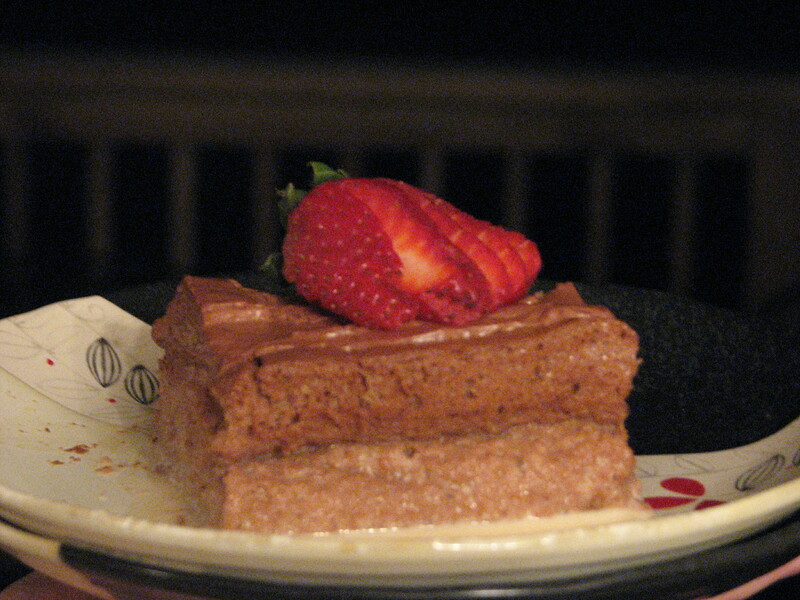 Makes 4 – 6 servings or it is enough to fill one 9-inch (23 cm) layer cake.